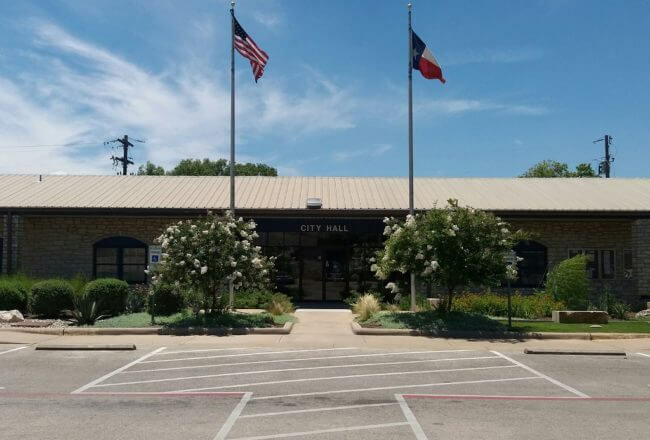 Travisso, a master-planned community in Leander, is minutes from Austin’s major tech employers, shopping and entertainment, and is just 30 minutes from Downtown Austin. Get away from the hustle and bustle and put roots down in a hill country setting without paying Austin prices. With four award-winning builders there’s a home to fit every lifestyle. Check out the current Travisso homes now available for quick move-in and even some coming soon. The Oakbrook Model – 4,604 square feet. This two-story stately home includes five bedrooms, four full bathrooms, one half bath, and a three-car garage. Beautiful inside and outside, this home boasts a spacious open floor plan with a first-floor owner’s suite. The deluxe gourmet kitchen, and dining and family rooms are ideal for family gatherings and entertaining. To learn more about this home visit the Drees model in Travisso at 1913 Portobello Road. The Kenwood Model – 3,849-4,133 square feet. The two-story Kenwood includes four bedrooms, four full baths, one half bath, and a three car garage. There’s room for everyone in the family in this gorgeous home. Enjoy long weekend breakfast chats in the comfortable and roomy gourmet kitchen. The second-floor game room is ideal for entertaining friends, or watching a movie. To learn more about this home visit the Drees model in Travisso at 1913 Portobello Road. The Colinas II model – 4,650 square feet. You’ll be wowed in this two-story residence with five bedrooms, four full bathrooms, one half bath, and a three-car garage. A spacious open floor plan, a beautiful gourmet kitchen, a luxuriously master suite, an upstairs covered patio, and attention to details throughout. To learn more about this home visit the Drees model in Travisso at 1913 Portobello Road. 4328 Orange Blossom Pass (Plan 559H) – 2,972 square feet. This two-story Highland home includes four bedrooms, three baths, and a two-car garage. A first-floor open concept plan with a kitchen, dining room and family room. The master bath features a large shower, tub, and two-sink vanity. Ready in April. Highland Homes (Plan 518T) – 2,018 square feet. One to two story residence, four bedrooms, three baths, and a two-car garage. Wonderful living spaces and storage areas in this home. Multiple options available to upgrade and make this home your own. Attention to detail and lots of trendy updates to choose from. To learn more about this home visit the Highland model in Travisso at 3905 Veneto Circle. Highland Homes (Plan 552) – 2,041 square feet. Options abound in this one-story residence from an award-winning builder. Choose from 3-4 bedrooms, 2-3 full baths, and 0-1 half baths. The floor plan includes a two-car garage. You’ll enjoy entertaining and chatting with family and friends in this open concept floor plan with a gourmet kitchen. 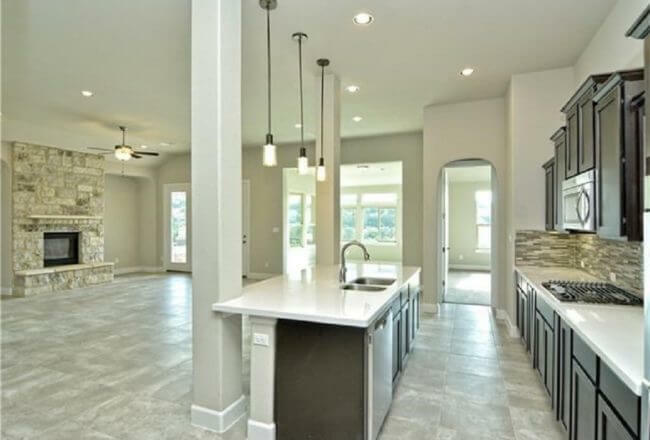 To learn more about this home visit the Highland model in Travisso at 3905 Veneto Circle. 4100 Belisario Court, (Geneva Model) – 3,177 square feet. You’ll love all the room in this two-story home with five bedrooms, four bathrooms, and a three-car garage. Many customizing features. Relax after a long day in the spa-like master bath with a corner soaking tub and walk-in shower. The second floor includes three secondary bedrooms, a game room, and media. Don’t miss this one. Ready in April. 4108 Belisario Court, (Preston Model) – 2,509 square feet. One-story residence with three bedrooms, three bathrooms, and a three-car garage. This home’s kitchen, breakfast nook, and family room area offer a comfortable place for hanging out with family. First floor study and stainless steel appliances too. Ready in May. 4209 Turin Drive (Chambray Model) – 2,275 square feet. With four bedrooms, three bathrooms, and a two-car garage this one story home has it all. Features include an extended foyer, a formal dining area, and a spacious gourmet kitchen area and breakfast nook perfect for weekend get-togethers. The owner’s suite located in the rear of the home offers plenty of privacy. Ready in June. 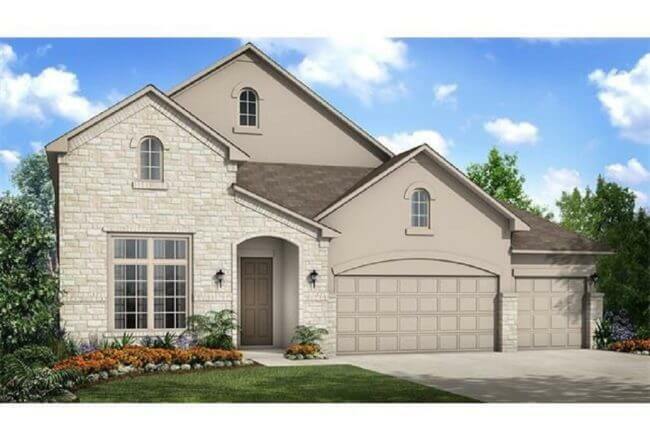 See all Taylor Morrison homes in Travisso. 4112 Belisario Court, (Longview Tuscan) – 3,673 square feet. This impressive home on a cul-de-sac lot includes four bedrooms, three bathrooms, one half bath, and a three car garage. The two-story foyer and great room are impressive. The master bedroom suite features a cathedral ceiling and spa-like bath. Attention to detail makes this home a stand-out. Ready for occupancy. 1804 Gilded Crest Drive, (Artisan Hill Country) – 4,404 square feet. Two-story residence with four bedrooms, four bathrooms, one half bath, and a four-car garage. This home greets you with a beautiful curved staircase and a two-story foyer. The spectacular kitchen features a walk-in pantry, a center island, and breakfast nook. Panoramic views throughout! Ready in April. 1716 Siena Sunset Road, (Sapphire Mediterranean) – 2,653 square feet. One-story residence with three bedrooms, three and a half baths, and a three-car garage. Contemporary living with all the finest details like tray ceilings in the foyer and a double door entry into the study await. The great room boasts a fireplace and views of the covered porch. Spacious secondary bedrooms. Ready in May. See all Toll Brothers homes in Travisso. Travisso, a master-planned community, is a place to explore; a place to relax; a place to call home. Discover over-the-top amenities, fabulous home designs, and our new model homes among the backdrop of the Texas Hill Country. What’s not to love? Plan a visit today. Additional information is available by contacting 512-243-8583.